Let's make sure your child has the proper kids soccer cleats. Kids soccer cleats are the make it or break it equipment for a child. It is not because they are necessary but it’s how well they are secured and feel to a child. Remember, a child will only complain if they are in pain or high level of uncomfortableness. Otherwise, it our job to make sure they are on right and secure for feel and comfort. As a coach for over ten years I can tell you that I could spend the first 10-12 minutes of a class or training just tying and re-tying kids soccer cleats. At one point I asked a group of kids to just come with the laces untied so I can tie them appropriately and have their parents see what appropriate means. So I am sure your wondering..what is appropriate? Well first the cleats need to be soccer cleats. Yes, there is a big difference between soccer, football, and baseball cleats. Lets take a look at the difference with some images below. 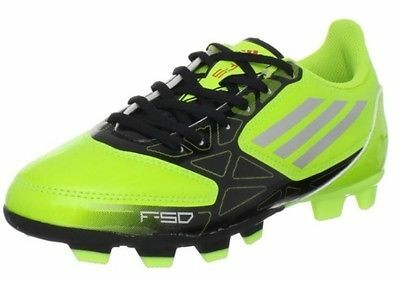 Kids soccer cleats are totally different than baseball and football cleats. Whats the big deal? football and baseball cleats are not meant to touch the ball. 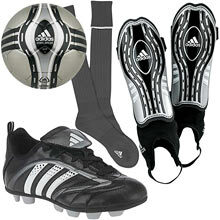 Soccer cleats need touch on the ball and so are made to have comfort touch with the ball. This has drastic consequences in learning the sport. The cleats here (left) are baseball and American football cleats. They are completely different than soccer cleats in many ways. The most important being functionality. These cleats aren't made to make contact with ball only to keep traxion on the field. So where can you get them? 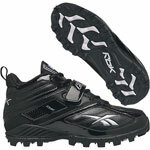 We suggest you go somewhere you can try the cleats on but for a good idea on prices go to Amazon. A soccer specialty store may be nearby. Google search soccer stores near me. The pair of cleats to the left are true soccer cleats. 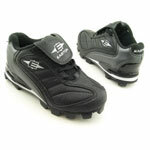 simple with molded cleats made from leather or synthetic leather. The other two are football and baseball cleats. I have seen many kids come out to to the field with baseball or football cleats and I cringe because every time they kick it's with their toe. The reason they use their toe is because both football and baseball cleats are bulky and have studs at the toe with extra leather covering. This facilitates toe kicking and does not allow the child to fully point the toe down. The soccer cleat is narrow almost pointy at the toe. With football and baseball cleats there is a bigger kick with the toe and facilitates a very bad habit! So please make sure to get some simple soccer cleats. Shoes or sneakers with rubber toes will prevent your child from getting touch on the ball and will facilitate toe kicking. If you don't have proper equipment make sure the shoes are not heavy at the toe. This is what your child should look like with shin guard and long sock together.